Ridley Scott is pushing 80. He will be 80 come the end of November which means by the time his second film of 2017 lands in theaters he will have hit that milestone of a birthday. That's right. Not only is Scott nearly older than most of your grandparents and making gigantic action/sci-fi movies, but he's making and releasing two big studio pictures a year (not to mention serving as a producer on multiple projects including the Blade Runner sequel). This second film, which looks as prestige as anything the filmmaker has produced since 2013's misfire The Counselor, follows the kidnapping of 16-year-old John Paul Getty III (Charlie Plummer) and the desperate attempt by his devoted mother Gail (Michelle Williams) to convince his billionaire grandfather (Kevin Spacey) to pay the ransom. When Getty Sr. refuses, Gail attempts to sway him as her son’s captors become increasingly volatile and brutal. With her son’s life in the balance, Gail and Getty’s advisor (Mark Wahlberg) become unlikely allies in the race against time that ultimately reveals the true and lasting value of love over money. The film is based on the true story of the 1973 kidnapping of John Getty III with a screenplay by David Scarpa (2008's The Day the Earth Stood Still). I'm liking all of what I'm seeing here whether it be the fact that Scarpa is the sole screenwriter on the project no matter his previous work, that Scott apparently shot this earlier this year and that it's already ready for release, as well as the fact the cast is rather exceptional with word on the street being Spacey might just give Gary Oldman a run for his money in the Best Actor category as Oldman has been the early favorite for his role as Winston Churchill where he is equally as made-up as Spacey is here. That said, Spacey is hardly the center of attention here, but more the catalyst supporting character as Wahlberg and Williams look to be leading this with solid chemistry to spare. Wahlberg may not be the greatest actor of his generation, but it's hard to argue his versatility based on his output in 2017 alone which will now include this crime thriller, a Transformers movie, and a broad comedy in Daddy's Home 2. Needless to say, I look forward to how this plays and am hoping, as always, for the best. All the Money in the World also stars Romain Duris, Timothy Hutton, Andrew Buchan, Olivia Grant, Teresa Mahoney, Marco Leonardi and opens on on December 8th, 2017. Synopsis: Rome, 1973. Masked men kidnap a teenage boy named Paul (Charlie Plummer). His grandfather, J. Paul Getty (Kevin Spacey), is the richest man in the world, a billionaire oil magnate, but he's notoriously miserly. His favorite grandson's abduction is not reason enough for him to part with any of his fortune. 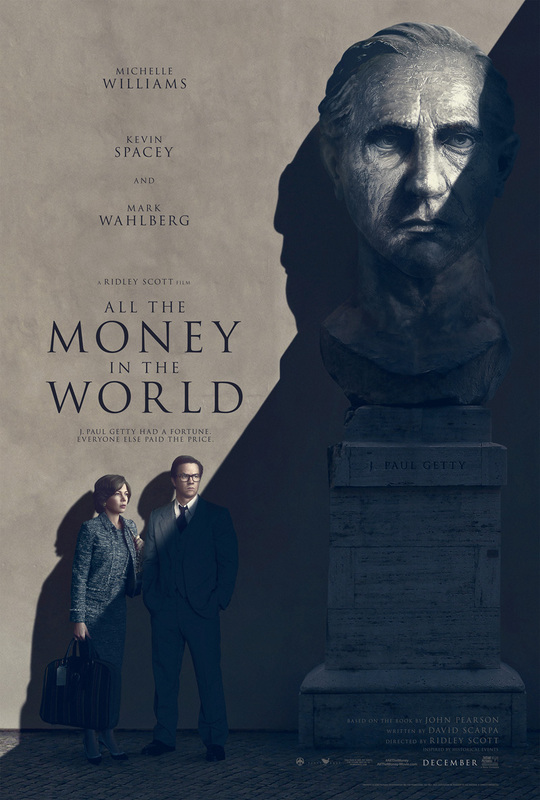 All the Money in the World follows Gail, (Michelle Williams), Paul's devoted, strong-willed mother, who unlike Getty, has consistently chosen her children over his fortune. Her son's life in the balance with time running out, she attempts to sway Getty even as her son's mob captors become increasingly more determined, volatile and brutal. When Getty sends his enigmatic security man Fletcher Chace (Mark Wahlberg) to look after his interests, he and Gail become unlikely allies in this race against time that ultimately reveals the true and lasting value of love over money.